ATLANTA — Soft drink giant Coca-Cola has introduced its first new flavor in more than a decade. The new flavor, Orange Vanilla, in Coke and Coke Zero Sugar, will hit stores nationwide on Feb. 25, the company said in a statement Friday. Coca-Cola began testing new Coke flavors a couple years ago after the successful relaunch of Coke Zero Sugar. Coca-Cola introduced flavors for its Diet Coke, including Blueberry Acai and Strawberry Guava, earlier this year, with other new flavors including Ginger Lime, Feisty Cherry, Zesty Blood Orange and Twisted Mango. But this is the first new flavor for regular Coke since Vanilla Coke, which the company re-launched in 2007, since it was phased out after its initial launch in 2002. A full marketing campaign launching in the coming weeks will support the launch across TV, social, digital, outdoor, mobile, radio and experiential. Basketball fans across the U.S. will see Orange Vanilla Coke and Orange Vanilla Coke Zero Sugar in stores and on the ground around NCAA March Madness. 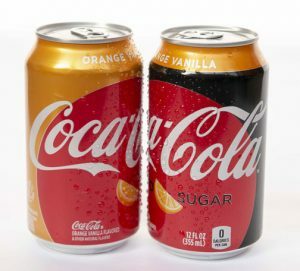 Orange Vanilla Coke and Orange Vanilla Coke Zero Sugar will be available in 12-oz. cans and 20-oz. PET bottles.